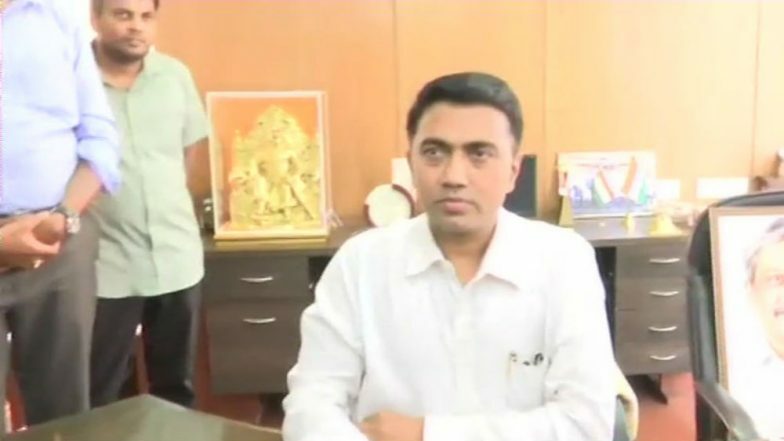 Panaji, March 19: Newly sworn-in Goa Chief Minister Pramod Sawant on Tuesday said the floor test will be held in the state assembly on Wednesday, March 20. After taking charge as Goa Chief Minister on Tuesday, Pramod Sawant said he will clear the floor test and run a smooth government. At the floor test, the ruling Bharatiya Janata Party (BJP) led coalition will prove its majority in the House. Pramod Sawant, the former Speaker of Goa Legislative Assembly, heads a coalition government which has the support of 12 MLAs from the BJP, three each from the Goa Forward and MGP, and two independent MLAs, taking the tally of the treasury benches to 20 in the 36-member state legislative assembly. The new Chief Minister said portfolios would be allotted to his ministers soon. CM Pramod Sawant will Boost Goa's Growth Trajectory, Says Narendra Modi. "We are going for the floor test tomorrow. There will 2 deputy CMs in this government- Vijay Sardesai and Sudin Dhavalikar. And I request all the people to not congratulate me or welcome me with flowers during the 7-day mourning period," he said. BJP MLA Sawant was sworn in as the 11th Chief Minister of Goa on Tuesday, following the death of Manohar Parrikar late on Sunday evening due to advanced pancreatic cancer. Sawant, 45, was administered the oath of office and secrecy by Governor Mridula Sinha at a formal ceremony held at the Raj Bhavan in the early hours of Tuesday.